Less Than Noble by J. M. Riou. 2016. Ebook. 285 pages. 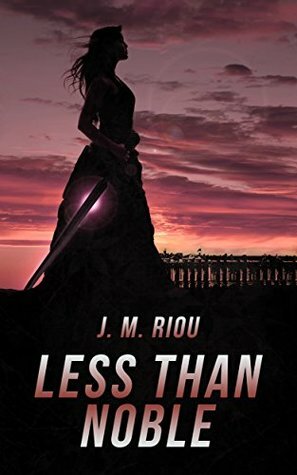 Last year I was given the opportunity to read J. M. Riou's first book, More than Monsters, which I ended up greatly enjoying, Just recently I was once again contacted by Riou about his second book, Less than Noble, so I happily accepted the offer and was eager to dive back into his exciting fantasy world! Given the fact that it's been a good year since I read the first book, I was a little fuzzy on details and thus was worried that this might pose a hindrance in following alone with major points in the second book, but I was pleased to discover that it didn't prove to be any issue whatsoever. In fact, I would even say that you could probably enjoy this book without having read the first one, though I would still encourage you to read the first one in order to have a larger introduction to some of the major players, such as Menton and Orthane. The beginning did, however take me a little while to get into, but there soon came a point where everything just sort of clicked into place and I was fully immersed into the involved world Riou has created. In addition to the previous characters introduced in the first book, Less Than Noble introduced some intriguing new characters, such as Chandolyn. On a personal level, I'm still not sure how I feel about Chandolyn, but as a character she is wonderfully constructed, and I enjoyed getting to know her personality. Indeed, each character has a strong, unique personality that makes it easy to distinguish one from the other, and I enjoyed discovering each character and their unique personalities, as well as viewing the varying interactions among one another. The only thing I could think to ask for was slightly more development of the characters as whole, but they still stood strong on their own. One of my favorite aspects of this book is a mixture of the time period and magic system used. The time period itself is a form of historic frontier, but with wide variety of other elements mixed in, which creates this oddly familiar yet wholly unique setting that really brings the entire story to life. The magic system is also rather unlike other systems I've read, so I found myself rather drawn to this particular aspect as well. Once again, Riou excels in his construction of action scenes. As I've mentioned in many of my reviews, I'm not normally a huge fan of action scenes, as I tend to have a difficult time following the movements picturing it in my head. This is not the case in Less Than Noble, as I found myself completely engaged with the fight scenes. If you are an action fan, then I would especially recommend this book to you. In addition to the many aspects I've discussed about Less Than Noble, at heart is truly an entertaining adventure. It has humor, depth, strong characters, and a fascinating world system, all of which are brought to life with Riou's careful attention to detail and skillful writing style. Overall, I have given it four stars! *I also want to add that I recently realized J. M. Riou's website, jasonriou.com, has an incredible amount of additional information about the world-building and world created for his novels, so I encourage you to visit if you have read, are planning to read, or are interested in learning more! It's my first time hearing about this book! :D Glad you enjoyed it! Thanks for sharing your thoughts :) Lovely review!